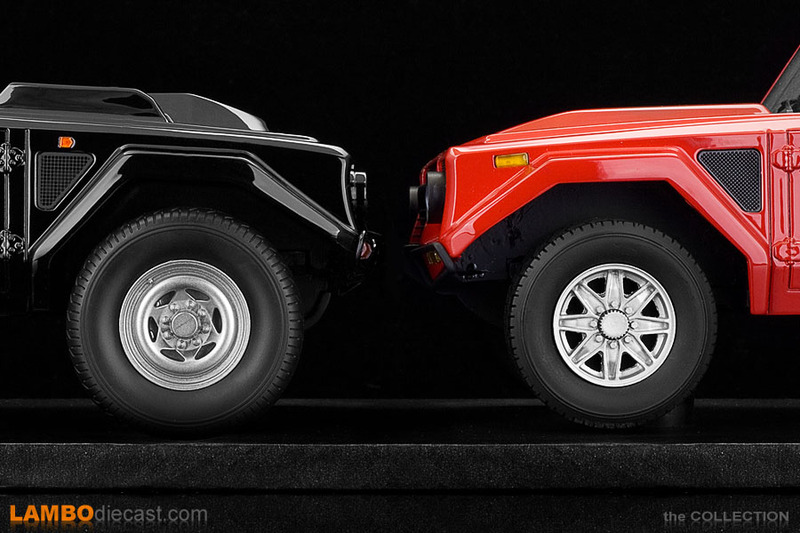 I have been very lucky to own the TRL made Lamborghini LM002 finished in red since 2014 as today this model is next to impossible to find, there is another red 1/18 Lamborghini LM002 available from time to time, but that one comes with the standard steel wheels and is made by CMF (#215478) while the model I own from TRL has the optional OZ Wheels that would also be used on the later Lamborghini LM002 American, the final production version of this massive offroad vehicle made by Lamborghini in the Eighties. 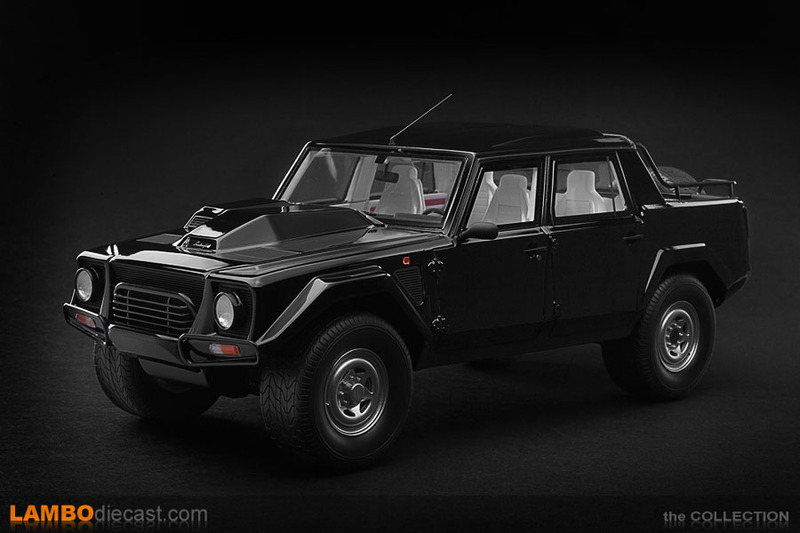 It took Automobili Lamborghini SpA a while to make their offroad adventure come together, starting with a prototype called the Cheetah that evolved into the LM001, both with the engine at the back, but the real 'test mule' for the LM002 production version would be the LMA002, not to be confused with the LM002 American ... the LMA002 was still a military-inspired offroad vehicle, but this time with the massive V12 taken from the Countach LP500 S, mounted at the front which created a monster, to say the least. 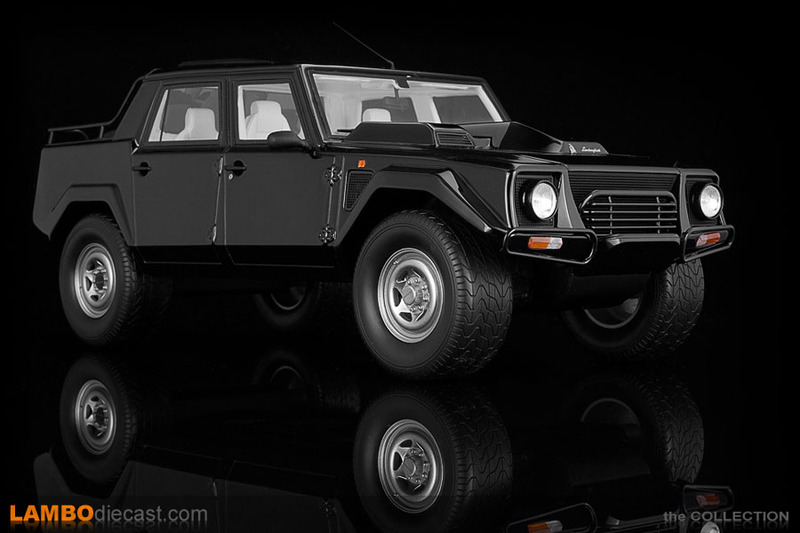 The actual LMA002 prototype was shown at the 1982 Geneva Motor Show, but it would take until the 1986 Brussels Auto Show before Lamborghini unveiled the LM002 production prototype, now with an engine derived from the Countach Quattrovalvole. 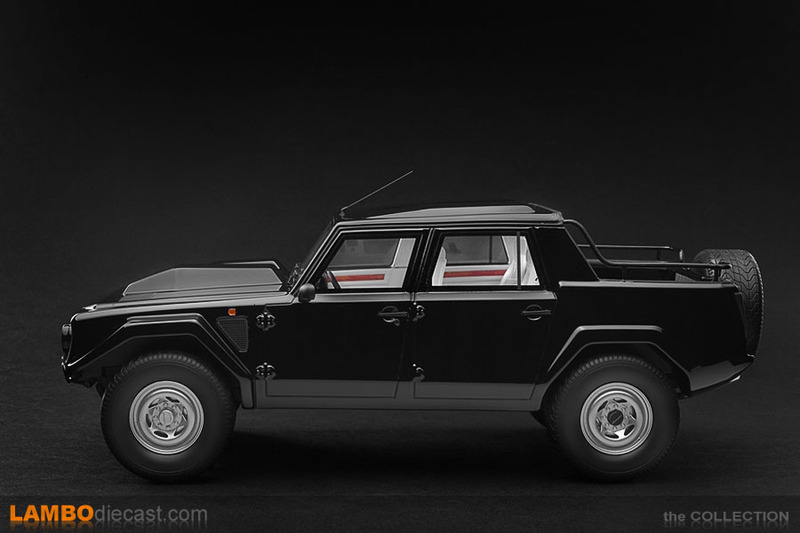 By lowering the compression rate 94 RON fuel could be used and at the Turin Motor Show in 1986 the production-ready LM002 was shown ... by the end of 1986 they delivered 23 brand new Lamborghini LM002 to customers. 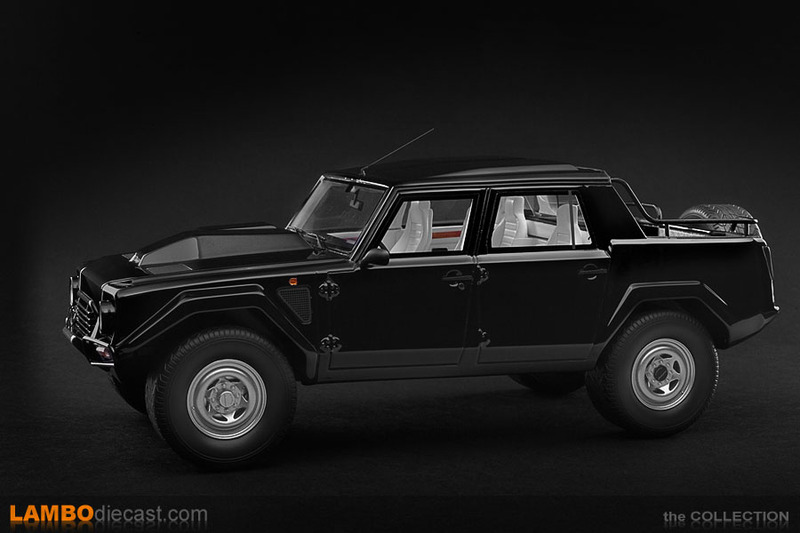 The Lamborghini LM002 would be in production for 7 years, one very rare option being a 7-Liter V12 engine taken from off-shore powerboat racing (only two or three LM002 were ever fitted with this engine), and a total of 301 units left the Sant'Agata factory by 1992, and despite the military original brief the LM002 became a luxury offroad car with four leather seats inside, thick carpets, air conditioning, tinted windows ... and an Alpine stereo fitted on the inside of the roof. 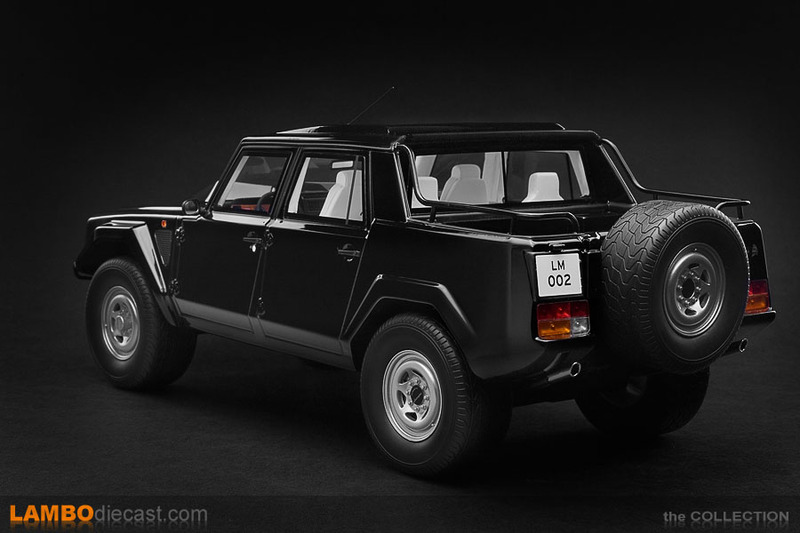 Early models of the Lamborghini LM002 used the Countach QV sourced V12 engine complete with the six dual Weber carburetors, this required a large, angular 'box' on top of the engine cover, later on, a more efficient fuel injected version of the V12 was fitted, which was visible by the more rounded and lower 'box' on the engine cover ... so there are two versions of the LM002 in real life. 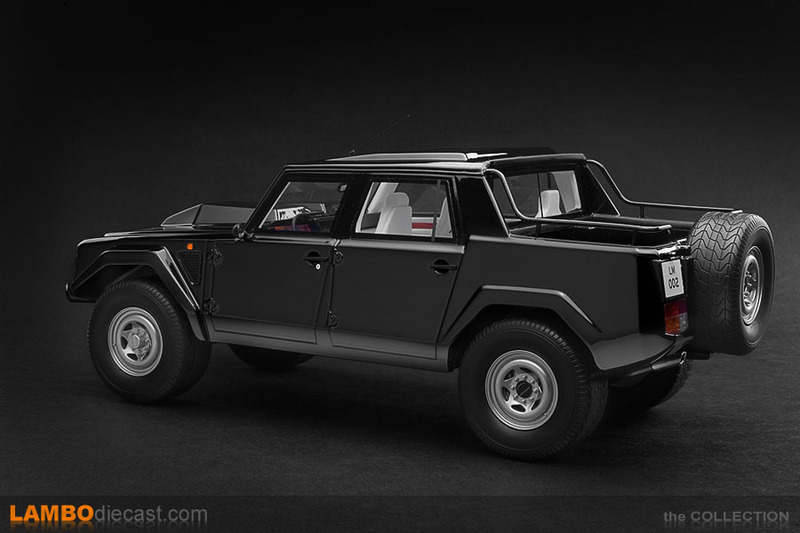 Today Lamborghini has the Urus on the production line, and we've seen several high power SUV over the years ... but there is nothing like the Lamborghini LM002 on the road, not in the past, not today ... and most likely never again ... the LM002 is a blast from the past that will never be built again. 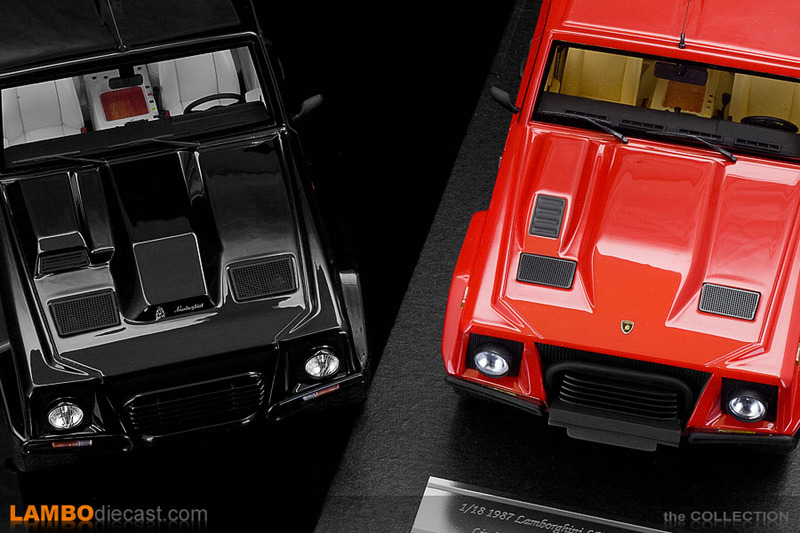 With the TRL made LM002 I already own being the later fuel injected model, I was very happy to learn this new GT Spirit/Kyosho made 1/18 model was, in fact, the early model with the large box on the engine hood, so I decided to add this new one to my collection too ... GT Spirit would release this model in white over a red interior while Kyosho went for black over white ... and when I found a listing online for the latter at a very interesting price I bought this black Kyosho edition. 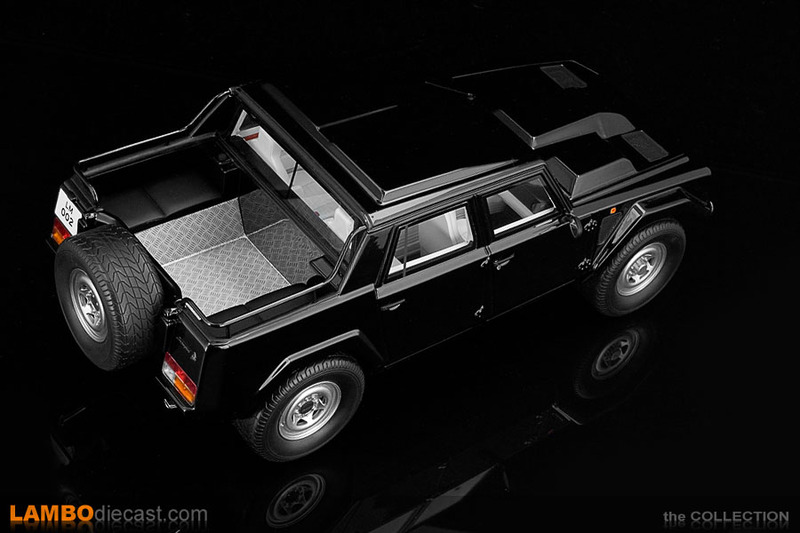 The box used for these LM002 models is larger than the usual GT Spirit/Kyosho box, otherwise the model wouldn't fit naturally, but also note this is a rather heavy resin model, and yes, it's a sealed resin model, nothing opens, but we know that about these models, so no point in turning this into a bad thing, it's sealed ... period. 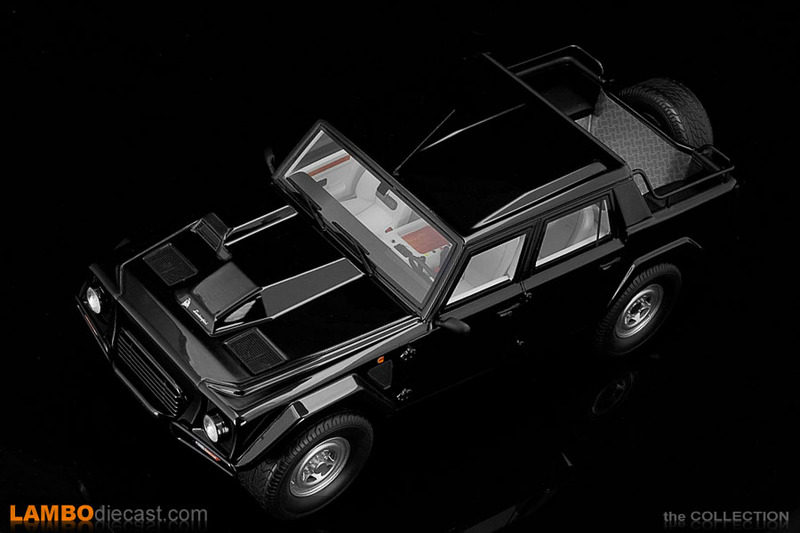 So no engine detail on these LM002, but the attention they spent on the interior is very impressive, remember we are talking about a car from the mid to late Eighties ... so it has wood fineer on the dashboard, central console and door panels. 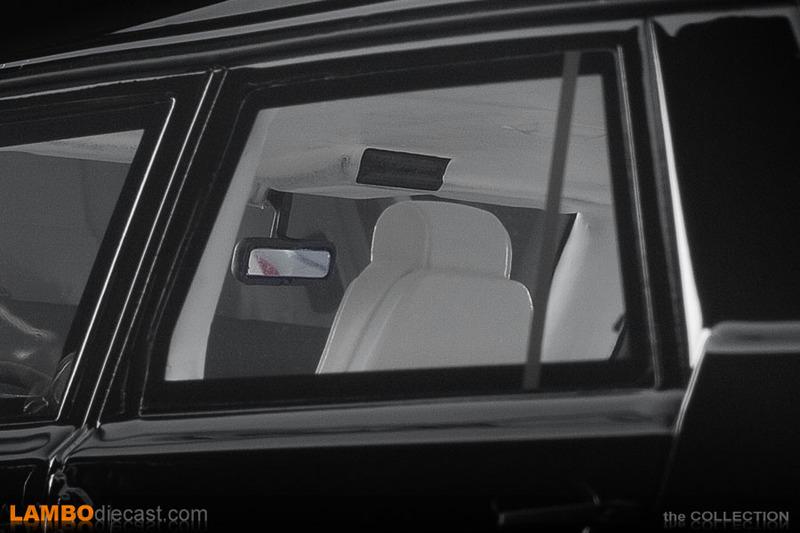 And speaking about the central console ... it's massive, very wide and runs all the way to the back, this is a four-seater on the inside, not like the Urus which can be ordered as a five-seater too. 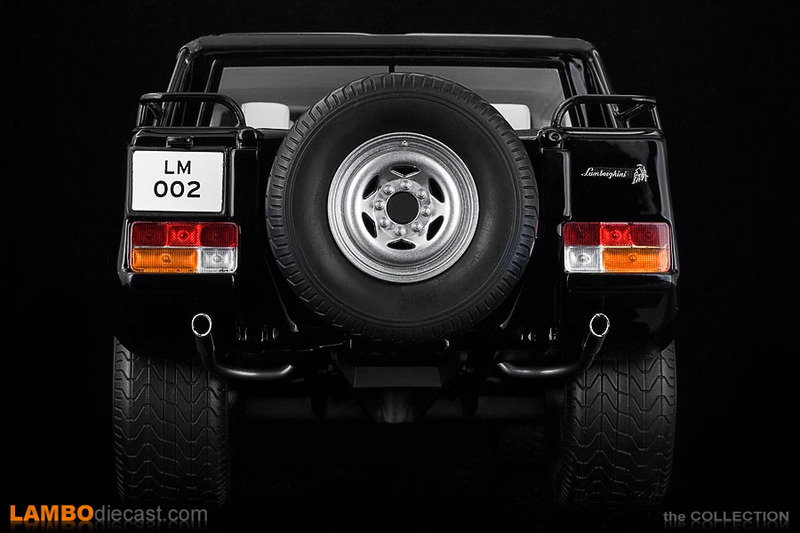 In the LM002 you get two body-hugging seats at the back and a massive central tunnel, which housed the driveshaft to the rear wheels naturally, note the LM002 isn't a full-time four-wheel drive car, in normal driving on the street the front wheels are 'free-spinning', you have to use a special tool to lock the front wheels and move a lever inside to go to full 'offroad' mode ... it's the Eighties ... you had to live with it. 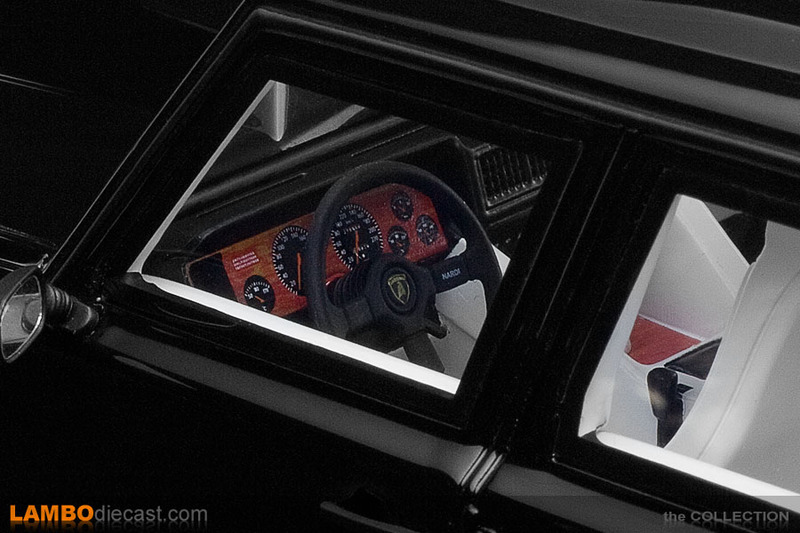 The attention to detail inside this Kyosho model is amazing, all those buttons on the central console are present, some in different colors, just like on the real car, the air vents are fitted, the gear shifter is there, and naturally that locking lever has been added too ... and if you really look close you'll find the Alpine stereo cassette player fitted on the headliner ... absolutely beautiful work by Kyosho. 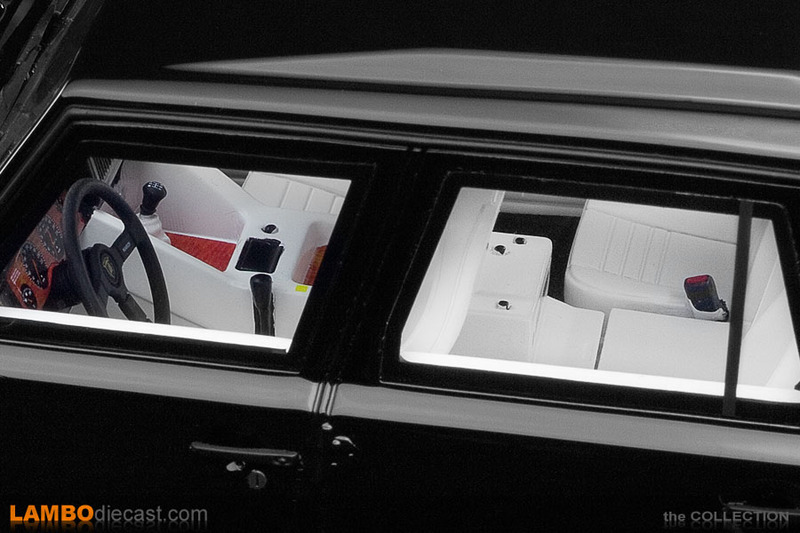 The detail on the four individual seats and the door panels is also amazing, there are even four seat belt clamps, one for each seat ... but I didn't see any seat belts, that would have been the cherry on the cake if Kyosho had white seat belts inside their LM002 ... 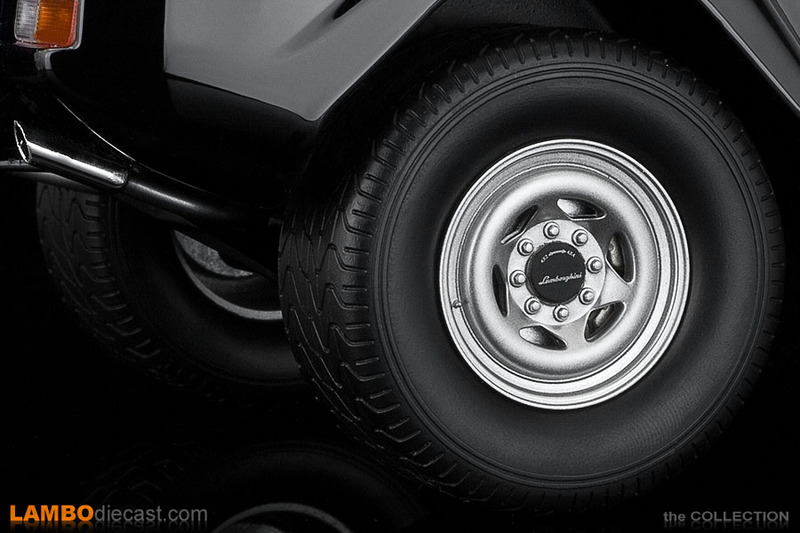 I guess you can't have it all. 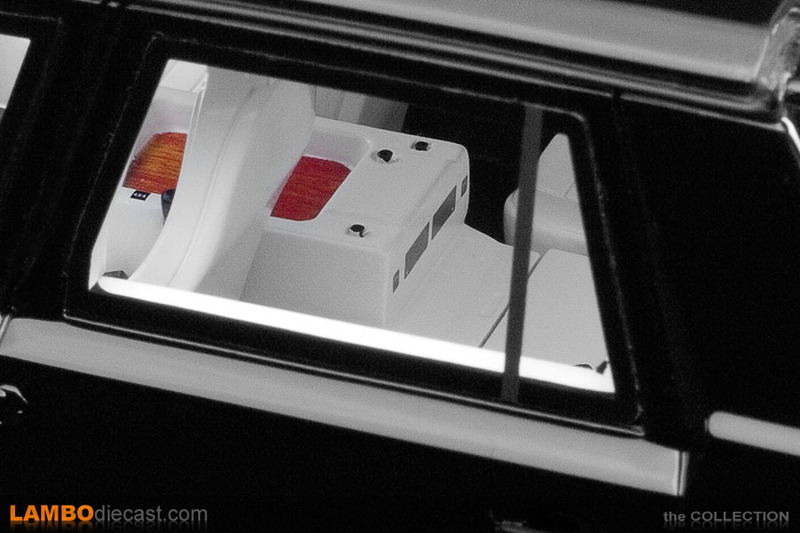 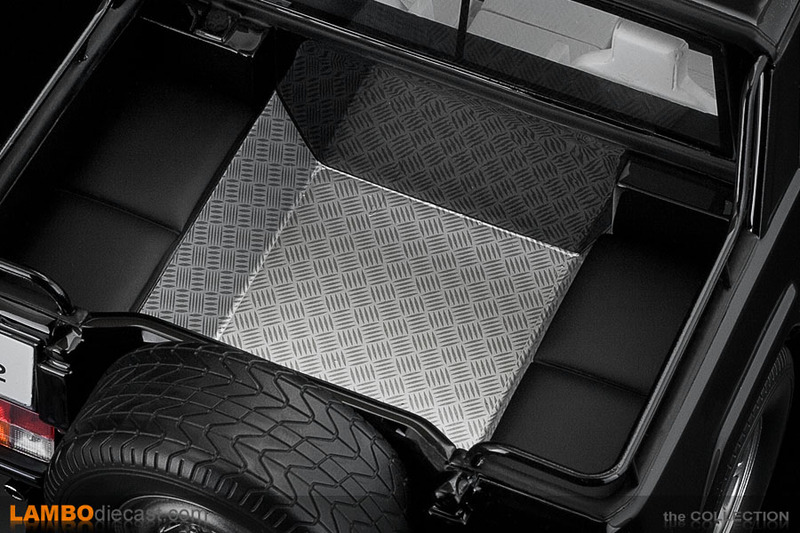 In the rear the Lamborghini LM002 offers six more seating spaces, now these might not be the most comfortable seats out there, but the space is available, although several LM002 owners installed a lockable luggage trunk or even additional fuel tanks in this spot ... the LM002 loves fuel, on the Kyosho model this section is fitted with black seat cushions and silver diamond plating ... although this diamond plate looks a bit too much like plastic on this Kyosho model, that is about the only negative I could find on the exterior of this model. 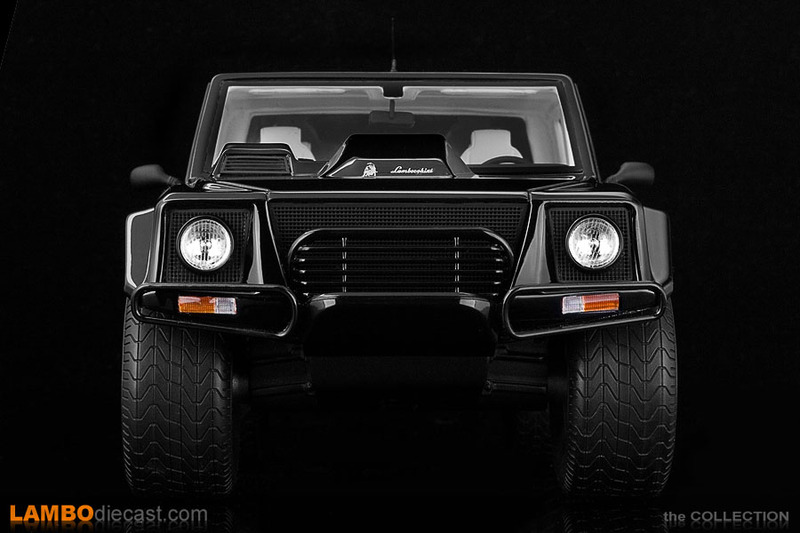 The rest of the exterior on this black Lamborghini LM002 by Kyosho is just amazing, this is an Eighties, flat panel car in real life, with large door hinges and not many fine details ... and Kyosho nailed it perfectly, the black paint has a tremendously deep shine to it, some might complain about the paint being applied just a little too thick, but I can live with that ... this model looks amazing and thanks to her size, she has a very attention demanding shelve presence between all those low riding Lamborghini supercars. 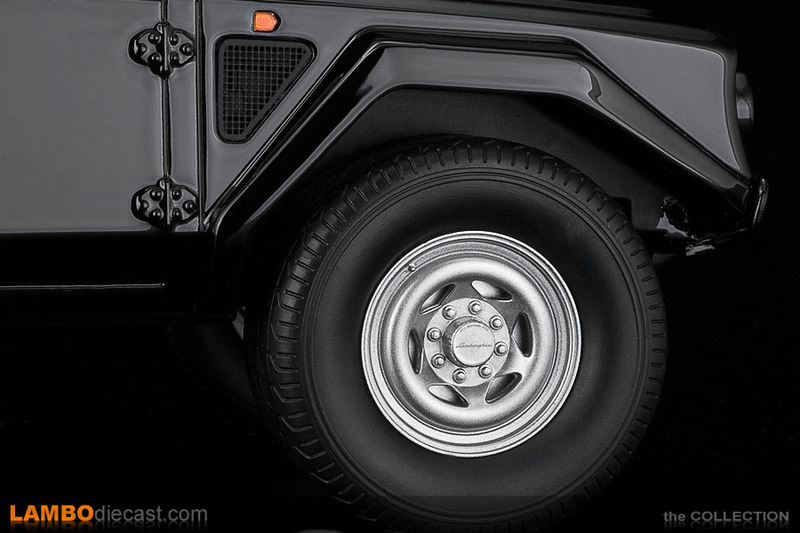 The detail on the silver wheels is spot on, even down to the special hubcaps up front with all those teeth for the special locking tool, Kyosho even has the Lamborghini script on the small caps on the wheels, the headlights look great, the taillights are perfect and even the thread on the tires looks authentic ... and I just love that antenna on the roof ... a very delicate item I'm sure, but it looks so great. 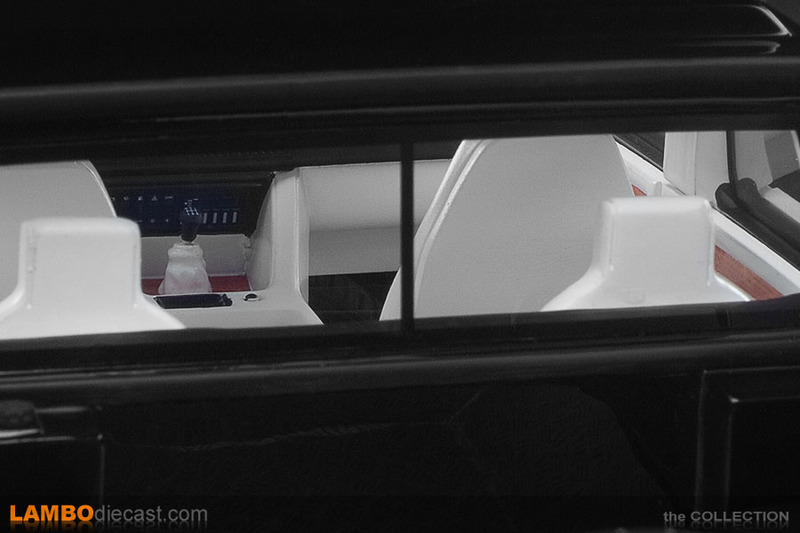 The grilles on the side and on top of the engine cover are open, the large front grille isn't, but you hardly notice that, so the overall impression is really good, one small detail I found puzzling me is the bumper ... Kyosho decided to but the small bumpers at the front of their LM002, but not at the rear ... usually in real life the LM002 came without bumpers (only standard on the LM002 American) or with the optional bumpers to the front and rear, so fitting bumpers at the front only seems strange to me. 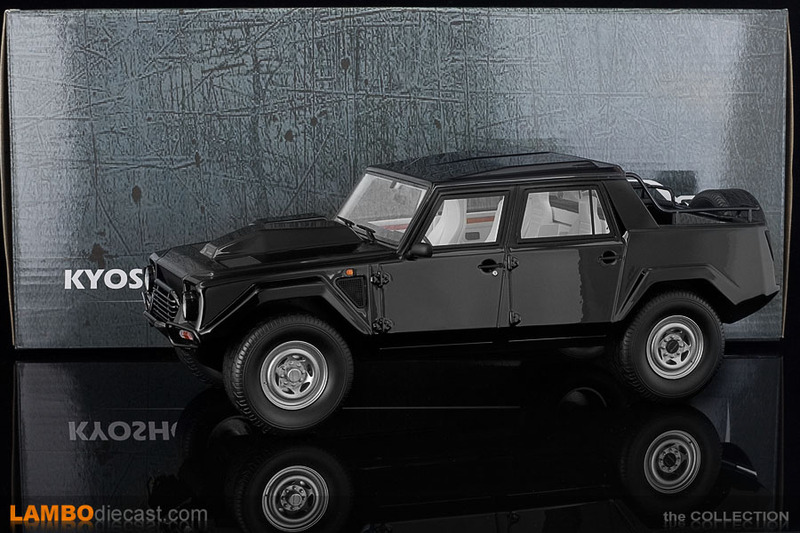 This really is a model you should add to your collection, it's not a supercar, but it's a Lamborghini, and I might add, it's a lot more impressive than the current Urus, you're only question should be: do I get this black Kyosho version or opt for the white GT Spirit made one ? 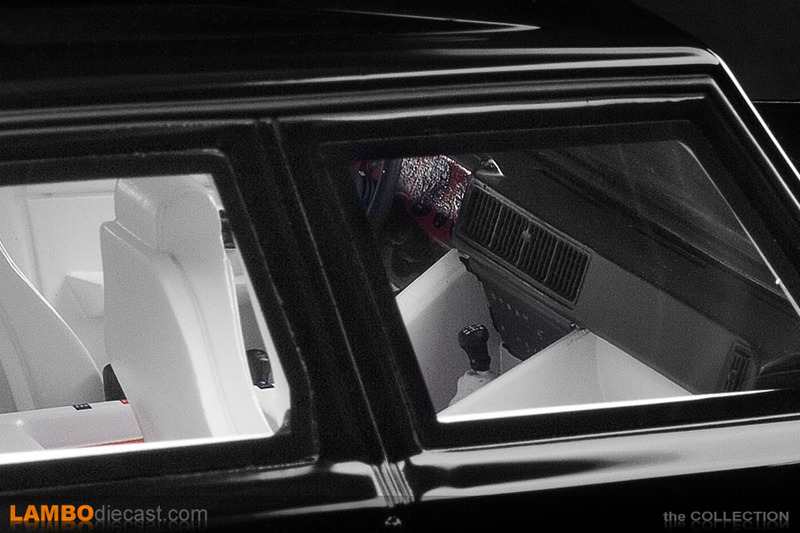 And that's a difficult question, I am very happy with this black on white version, but I couldn't resist adding the white on red one too, it's just so good looking too ... if I had to choose only one I would really have no idea ... and it would come down to price, which one could I get for the least amount of money. 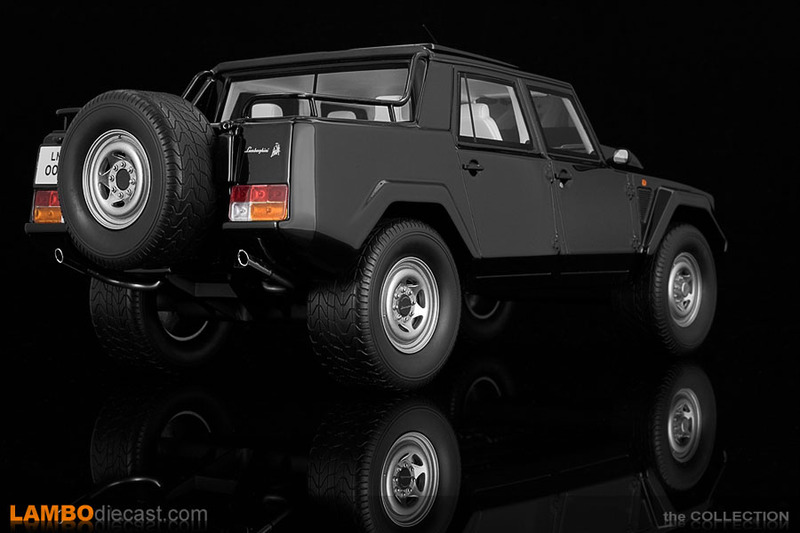 I love the Lamborghini LM002 for what she represents, a dinosaur from the Eighties that guzzles fuel like no other, doesn't even drive all that well from what I've heard, finding tires is an adventure ... but there is absolutely nothing like the LM002 on the market, so adding this 1/18 scale model to my collection was a great feeling, even more so as it is the carburetor version that now accompanies my red fuel injection model.